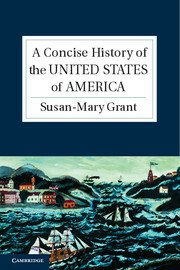 In an exclusive interview, Susan-Mary Grant, author of ‘A Concise History of the United States of America‘, talks about the challenges of writing a new history of America and the persistent tensions therein. What were the challenges you faced in writing A Concise History of the United States of America? I suppose the biggest challenge was how to structure the book so that it offered readers a fresh and accessible perspective on the history of the United States. This is a crowded market, and there are many general histories out there, some specifically intended as textbooks and others as broader, more conceptual studies. The Concise History of the United States seeks to straddle not just that marketing divide but also the traditional divisions applied to American history. In short, I wanted to blur the usual periodization of the subject into Colonial, Revolutionary, Civil War and Reconstruction and so on in order that the reader could position contemporary developments within a deeper historical context, stretching all the way back to the nation’s colonial beginnings rather than starting, say, with 1776. So achieving narrative coherence whilst maintaining chronological direction was a challenge, and inevitably, given that it is a ‘concise’ history, certain aspects of America’s national story were highlighted whilst others were relegated to the background. In the process of writing, I inevitably wanted to turn each chapter into a full-length book, and it was difficult in places to force myself to move on and leave behind individuals and events that I wanted to tell the reader more about. The history of the United States is marked by so many watershed events. Conceptually, how did you organize this volume? That’s a very good question. Any general history, concise or not, of any nation is inevitably selective. In the case of the United States, one could choose to begin the story with the nation’s founding, with 1776, which would have had the merit of being more accurately a history of ‘the United States.’ I felt that to do so, however, would be to risk misrepresenting America’s national story, taking much of what you term the “watershed events” out of their broader context and over-simplifying the complex process that was the creation of a new nation. I wanted to draw out the ways in which many of the tensions – between black and white, freedom and slavery – that America struggled, and struggles with, had their origins in the colonial experience, but I also wanted to emphasize the ways in which a single story can be told, and smooth out – as far as possible – the traditional divisions that historians inevitably have to impose on the history of any nation. For this reason I tried to avoid moving from the Revolutionary era to the Early Republic, from the Early Republic to the Antebellum Era, on to the Civil War and Reconstruction, then to the Gilded Age and Progressive Era, before landing in the twentieth century and embarking on a steady narrative through the World Wars, Civil Rights, Vietnam, and America’s global role. For one thing, to do so in any degree of detail would have resulted in a much longer book; for another, I felt that the ways in which different forces impacted upon the nation at different times and some consistently would be better explained if the chapters overlapped chronologically, if readers were moved, for example, via the railway from the battlefields of the Civil War to the West, or from slavery to civil rights via the experiences of an individual, in this case Ida Wells Barnett. Above all, I was striving for a narrative balance between the thematic and the chronological, and between the national story and the individual experience within it. You highlight the many tensions inherent in America’s growth, especially the notion of freedom and liberty. How did this notion create paradoxes in American society? The most striking paradox in the development, indeed the very formation of the United States, of course, was the idea that all men are created equal being enthusiastically promoted by slaveholders. Again, the problem was most succinctly summed up by Abraham Lincoln in the course of America’s Civil War (1861-65) fought between the Union and the slave-states of the Confederacy. “We all declare for liberty,” he observed, “but in using the same word we do not all mean the same thing.” To a great extent that held true for Americans in the Revolutionary era as for those in the Civil War, and indeed at several points since. In part, as I tried to highlight in the book, it came down to differing conceptions of freedom: freedom as a civic ideal, which the state could, in legislative terms, cultivate or curtail, and the idea of freedom as a universal right, the ‘cause of all mankind,’ as Thomas Paine defined the colonial cause in 1776. Critics of the United States have an easy target, in some respects, because of the nation’s apparent failure to live up to the ideals of the Declaration of Independence as far as life, liberty and the pursuit of happiness is concerned. And there have been times in the nation’s history where the individual rights of American citizens have been ruthlessly curtailed by the state in the name of national freedom, specifically in the case of the resettlement of Japanese-Americans during the Second World War, and more generally, and persistently, in terms of the denial of equal rights to African and Native American citizens for much of America’s existence. In the twenty-first century, certainly for outsiders, the United States can still seem a nation of contradictions as far as freedom and liberty are concerned, especially with regard to the PATRIOT act. Freedom, as the cliché has it, is not free, but the question of just how unfree it might turn out to be is hardly a new one, and has exercised Americans since 1776. You teach American history at Newcastle University, and you’re British by birth. What led you to pursue an academic career in this field? Another good question! And I think the answer lies in a possibly rather contorted combination of cultural influences in childhood of which, at the time, I was probably unaware and my discovery of the subject at university. In terms of cultural influences, literature was my earliest introduction to the United States, as I (in common with many girls, I imagine) devoured the novels of Laura Ingalls Wilder absent any real sense that the world being described was over three thousand miles away from my own; or perhaps that was the source of the fascination. At university and at graduate school, my growing interest in the United States was partly a practical decision – so many of my contemporaries were studying British history, and I could do the math and I did want a job. That certainly later drew me more strongly toward the nineteenth century United States, which is my area of research interest, as almost all my contemporaries in the field of American history were studying the twentieth century. However, having put myself in the middle of America’s history, as it were, I simply found it the most fascinating period, involving the most complex people and circumstances, and the most influential – for the modern world – part of global history. I note in my Introduction that I have, over the years, frequently fielded the accusation that the study of the United States is in some respects an easy ask, being as it is so short and largely written in English! And certainly such attitudes can prove to be a handicap when it comes to teaching the subject. British students, long used to the dominance of the United States in the media, entertainment and internet environments in which they operate too readily assume that they already know all there is to know about America; showing them that this is not the case, and that a lifetime’s study would not begin to scratch the surface of that vast and vigorous country reminds me of why I chose a career in academia, and chose to devote that career to the study of America. Goodness; how long is a piece of string? There is so much exciting work being done on American history that identifying specific recommendations is difficult. The bibliography in my book, however, is designed to guide those interested in reading more to some of the most important and insightful studies of different periods of American history (Colonial, Revolutionary, Civil War, Cold War etc.) so I would probably suggest starting with that. Yes. I am in the process of finishing up a book on Civil War soldiers and veterans and their role in and relationship with the evolving nationalism of the nineteenth- and early twentieth-century United States, and after that a short biography of Oliver Wendell Holmes, Jr. is in the pipeline. Can you describe your book in three words? Not easily… Informed. Insightful. In a bookshop near you! Well, the first book I ever read probably involved bunny rabbits and a visit to the park, but the first one that had an impact on me was Scott O’Dell’s now classic (although it had probably not acquired that status at the point when I read it) ‘Island of the Blue Dolphins’ (Houghton Mifflin Harcourt, 1960). This may account for my interest in the nineteenth-century United States although not the Civil War, since it is set off the coast of California. And finally … Do you think Obama will still be in the White House come Christmas? Outgoing American presidents are not given twenty-four hours to clear their desks; they cede control in January of the year following the election, so either way, Obama could still be in the White House come Christmas. How long after that he stays there may largely depend on how the American economy performs over the summer, since Obama is struggling against what Gallup pithily terms ‘economic headwinds.’ Non-fiscal factors will come into play, too, however, not least America’s global position and the perceived personalities of the candidates themselves. The American electorate, possibly to a greater extent than some others, regard the President as symbol of the nation at a fundamental level; so although it may largely come down to internal economic and social factors, external ideological and international issues will also play a part. Historians are obviously far better at analysing the past than predicting the future, but on balance, I would say that the likelihood is strong that Obama will win in 2012. Where do you see the United States of America in 10 years time? To follow on from the previous question, it is notable that Obama’s election campaign to date has placed a degree of emphasis on his nation’s global role, and he has echoed former Secretary of State, Madeleine Albright’s description of America as the ‘indispensable nation’ in world affairs. I’m not sure that this is necessarily a given in the current and rather paranoid global climate in which we live, one in which the geographical ‘border’ has become such a perceived security threat on both sides of the Atlantic, policed by ever more rigorous procedures that themselves threaten to stifle as much as ensure the safety of the nation state. America has long had a ‘borders’ issue, not least because, historically-speaking, as a nation its own have extended to encompass other nations and other peoples. Defining, and by extrapolation defending, America, in other words, has been an issue for over 300 years, and will probably remain so in ten years time. At the same time, the United States retains a huge potential for international influence, but to a greater degree, perhaps, than some nations it reaps what it sows in that respect in that other nations are frequently forced to reflect America’s direction of travel. So the question of where America is in ten years may also be the question of where we are, too. I would like to think that in ten years time the United States may once again be an economically secure, socially vibrant, and internationally influential nation, but I accept the possibility that it may be the main metaphorical closed shop in a rather more downbeat world of increasingly defensive democracies.